For the first time ever, lifesaving blood transfusions will be carried out at the roadside in south east Scotland after the Medic One flying squad launched a breakthrough treatment. The charity, which is based at the Emergency Department of the Royal Infirmary of Edinburgh, will perform emergency transfusions at the scene of an accident, rather than a patient waiting to arrive at hospital. The blood will be stored a special cool box to ensure it can be put back into the hospital transfusion system if it is not used and to ensure none is wasted. Using advanced equipment, funded by the Medic One charity, the blood can we warmed at the roadside, as it is transfused to the patient. It is expected that the team of highly skilled emergency medicine doctors and nurses will now be able to help save scores more lives of major trauma patients. “We treat around 80 patients a year who have suffered major illness or injury. The leading cause of death after a major accident is bleeding. The Medic One charity provides a team of skilled Emergency Medicine doctors and nurses to attend serious incidents in Edinburgh and the Lothians. The team attend serious calls, such as road accidents, and require immediate, intensive, life saving interventions. They bring the hospital to the patient with skilled clinicians and equipment and have now boosted their skills with the launch of emergency blood transfusions. Roadside transfusion was launched on December 3rd following close collaboration between the Emergency Medicine and Blood Transfusion departments of NHS Lothian. “Staff at the Royal Infirmary of Edinburgh Blood Transfusion department have installed a blood transport box in a dedicated refrigerator in the Emergency Department capable of meeting the strict criteria required for storing blood. “This exciting step is one of several improvements that have come about through our close working with the Emergency Department and which aim to provide clinicians with the best possible transfusion service for these seriously injured patients. “Future funding is critical to continue to provide this service for patients in Edinburgh and the Lothians. Medic One is the oldest pre-hospital care team in the UK. Launched in the 1980s by Dr Keith Little, it takes the hospital to the patient in order to provide lifesaving care at the scene of an accident or serious incident. 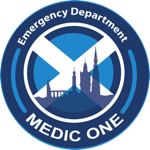 Based at the Royal Infirmary of Edinburgh Emergency Department, Medic One is activated to attend patients across South East Scotland, from the Borders to Fife. Medic One is a charity, generous donations and annual fundraising events help us purchase up to date equipment to save further lives. Find out more here.